We have been baking and trying new recipes this summer. 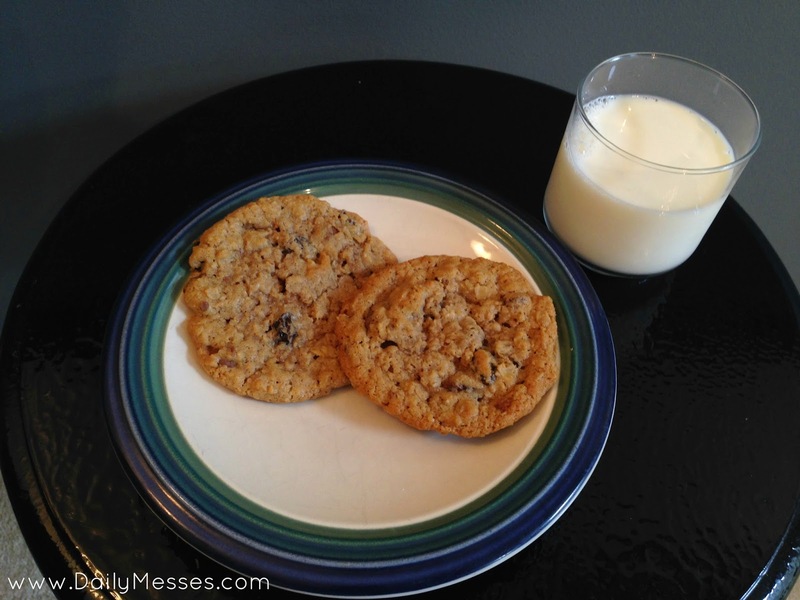 I can remember making oatmeal raisin cookies with my mom, but I hadn't made them with the boys yet! The cookies were a big hit. The boys loved them and so did hubby's coworkers when he brought them into work. We've made them several times now and they love them each time. *We like a lot of stuff in our cookies, so I added 1 1/2 cups of raisins and chocolate chips. 2. Set aside oats, raisins, chocolate chips, and flour. Combine all other ingredients in a large bowl. 3. Stir in flour, oats, chocolate chips, and raisins. 4. Line cookie sheets with parchment paper. 5. Drop rounded tablespoons of dough onto sheet, about 2 inches apart. 6. Bake 9-11 minutes, or until lightly browned. 7. Remove from oven and cool on cooling rack. DM TIP: I find it easiest to simply move the parchment paper with the cookies still on it to the cooling rack. The cookies cool and don't get smooshed being moved.